Jailen Bates is all smiles while passing out plates at the Nickelodeon HALO Presents the Salvation Army’s Feast of Sharing Holiday Dinner on Tuesday (November 24) in Los Angeles. The young actors attended the event at Casa Vertigo and were joined by several of their Nickelodeon co-stars for the charitable dinner. Also in attendance were W.I.T.’s Andrew Ortega, Ryan Cargill, and Kennedy Lea Slocum. Every Witch Way star Autumn Wendel showed up and posed alongside her co-star Ethan Estrada. 100 Things to Do Before High School‘s Jaheem Toombs and Nicky, Ricky, Dicky & Dawn actor Casey Simpson snapped a few silly pictures together also! How cute are Nicky, Ricky, Dicky and Dawn in their elf costumes in this exclusive shot from this weekend’s episode? 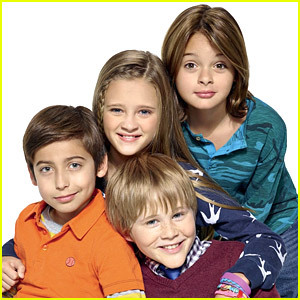 In “Santa’s Little Harpers”, Nicky (Aidan Gallagher), Ricky (Casey Simpson), Dicky (Mace Coronel), Dawn (Lizzy Greene) want the newest video game console for Christmas, so Tom (Brian Stepanek), Anne (Allison Munn) make them work at the store to earn the money to buy it. Then, it becomes every quad for themselves as they compete over tip money. Good luck Quads! “Santa’s Little Harpers” airs Saturday, November 29th @ 8:30PM ET/PT on Nickelodeon. Who’s ready for the premiere of Nicky, Ricky, Dicky & Dawn TONIGHT?! Lucky for you, JJJ has an exclusive clip from the series premiere! Check it out below! The show, starring Aidan Gallagher, Mace Coronel, Casey Simpson, Lizzy Greene (as Nicky, Ricky, Dicky and Dawn), hits Nickelodeon TONIGHT, Saturday, September 13th, @ 8:30PM ET/PT. The show follows the hysterical adventures of the 10-year-old quadruplets who don’t have much in common, except their birthday. Gabrielle Elyse also stars as Josie, a close friend and confidante to the kids and an employee at the Harper family store Get Sporty. 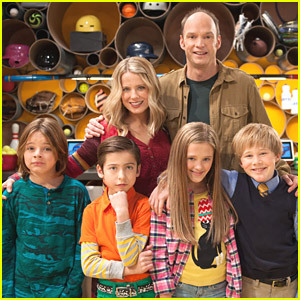 The cast of Nicky, Ricky, Dicky & Dawn all look like one happy family in this new still ahead of the show’s premiere. Starring Aidan Gallagher, Mace Coronel, Casey Simpson, Lizzy Greene (as Nicky, Ricky, Dicky and Dawn), plus Allison Munn and Brian Stepanek (ARWIN! ), the new comedy premieres on Nickelodeon on Saturday, September 13th! Nicky, Ricky, Dicky & Dawn follows the hysterical adventures of the 10-year-old quadruplets who don’t have much in common, except their birthday. Gabrielle Elyse also stars as Josie, a close friend and confidante to the kids and an employee at the Harper family store Get Sporty.